26 January 2015, at 9:48a.m. CANADA - The F.X. Aherne Prize for Innovative Pork Production at the 2015 Banff Pork Seminar in Banff, Aberta was shared this year, recognising two impressive hog innovations. Lyle and Maaike Campbell of Birnam Pork, Arkona, Ontario won for an innovative piglet weigh scale, which boosted profitability in that operation. And Greg Feenstra and Dave Uttecht of Heartland Pork, LLC in Alpena, South Dakota, US won for their 'EZ Tub' hog handling innovation which significantly reduces stress on animals and people, reports Meristem Land and Science. Dr Michael Dyck of the University of Alberta and chair of the F.X. Aherne prize committee, explained: "Innovation is always fascinating and this award is one of the most popular aspects of the annual Banff Pork Seminar. The prize recognises those individuals who have developed either original solutions to pork production challenges or creative uses of known technology." The award is named after industry icon, the late Dr Frank Aherne, a professor of swine nutrition and production at the University of Alberta in Edmonton and a major force for science-based progress in the western Canadian pork industry. The innovative solution to weighing young piglets from Lyle and Maaike Campbell of Birnam Pork [pictured above] was low-cost and had a direct benefit on their bottom line. Birnam Pork produces weaned piglets that excel in the grower-finish phase of pork production. They needed some way to weigh those piglets so they could ensure they were meeting marketing objectives and getting paid for their efforts. Their scale was built onto a lightweight base that is easily transportable and washable. A lightweight container on top is tall enough that 18-day-old piglets cannot jump out but low enough to be reachable. It features a tray to carry spray-markers and a spot to collect sow cards. The scale design allows for numbers on the scale to be viewable from all sides. It is flexible enough to use with smaller piglets and can be used to calibrate feeders. 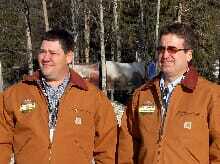 Greg Feenstra and Dave Uttecht [pictured right] of Heartland Pork designed the E Z Hog Tub hog handler. It helps reduce stress on pigs and people during loading, produced faster loading and lower plant losses. And it accomplished that with very little expense. The E Z Tub's circular tub-style design works with pigs' natural response patterns to aid in the loading of market hogs. The pen and gate configuration lets the handler work where hogs can see them and uses the pigs' circling behaviour to set up a flow onto the trailer. That reduces stress and produces fewer discounts for injured animals at the packing plant.